And for that matter, how did the Working Families Party endorse the same candidate as the Conservative Party?? it IS helpful! It's better than staying home because you're disillusioned; it shows that voter apathy can mean more than laziness. Could you imagine if "None of the Above" made a dent?! I hereby announce my candidacy for any otherwise unopposed office in the 2012 elections. 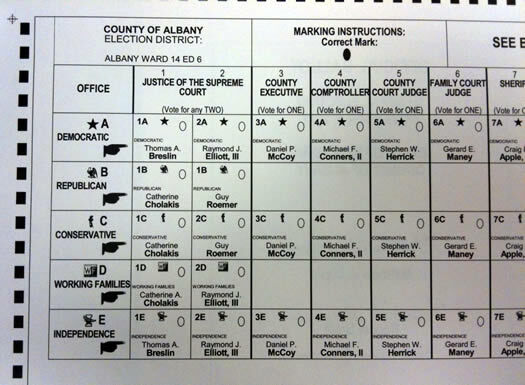 In 2011 I received at least two write in votes in Rensselaer County. That has to qualify me for something. I agree with Herman. It is better to record a no vote or a write in. But for it to matter folks have to let those in charge know thaty it is an organized effort. It's the opposite further upstate. Good luck finding a Democratic challenger to the Republicans up here in the Glens Falls area. I don't know if I agree with your argument. We see what happens when democrats have to "earn it". They move to the so-called center & start acting like republicans. I wouldn't want that here. I love that Albany makes it easy for progressive politics to flourish. At least, in theory. Any time one political party exists in a vacuum is bad for the people. Anyone who doesn't understand this and cheers because their Red Team/Blue Team gets all the power is ignorant of human behavior. We Greens have a ballot line now, and when we run candidates we have come close to beating the Democratic dictatorship here in Albany. If people are interested in running an anti-machine, anti-Democratic monopoly campaign in Albany on the Green line and accept Green values of grassroots democracy, social and economic justice, nonviolence, and ecology they should contact us at www.gpnys.org. It would make it so that the parties would have to send better candidates to the table. It would make a huge change in the United States, and for that reason it's unlikely to be implemented without a huge fight. OR a sizable minority of write-ins. In good news, Mackey lost! "I love that Albany makes it easy for progressive politics to flourish"
If you are wondering why we have problems in Albany, look no further than this comment. Apparently we have a flourishing progressive paradise here in Albany. Why would we want to change that? I have no idea who the guy was running on the "South Troy Against The World" partly line, but he has my vote. I didn't vote for any uncontested races last night. It was discouraging. I should've added a write-in candidate for each. When I looked at the ballot I lamented, "I put on pants for this?" I LOVE KatherineSass' comment. I could have let my voice be heard in a more useful way by occupying somewhere last night. And they said the machine was dead.